Free standard delivery in our local Essex area with 5% online discount! Wonderful hand-tied of fresh flowers in warm Autumn colours beautifully presented in their own bubble of water with a big bow and pretty message gift card. The bouquet includes flowers such as Roses, Gerberas, Berries etc. together with luxury foliage. You can add a delivery date during checkout. Now with Eco-friendly packaging! A florist favourite. 5% online discount and free delivery! 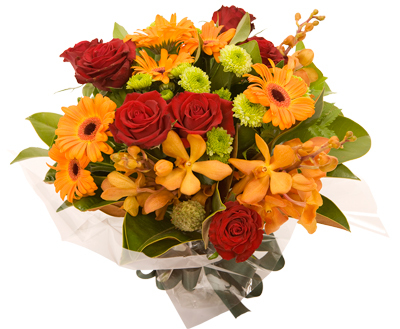 A wonderful handtied of fresh seasonal flowers in warm autumn colours including flowers such as Gerberas, Roses, Lilys, seasonal filler such as berries, Solidago, Green Chrysanths etc together with Grass and Leather Leaf fern. Beautifully presented, and standing in their own bubble of water these flowers will arrive as fresh as possible and already tied so the recipient doesn't have to re-arrange - a lovely gift for all occasions. Includes a floral gift message card. Vase not included. 5% online discount and free delivery in our flower delivery areas including Braintree, Witham Chelmsford and surrounding towns and villages. Free delivery in our local Essex area and 5% online discount. Wonderful fresh Roses and Gerberas in a hand-tied, standing in a bubble of water with a big bow and pretty gift message card - a lovely combination! Choose your own colours! You can add a delivery date during checkout. 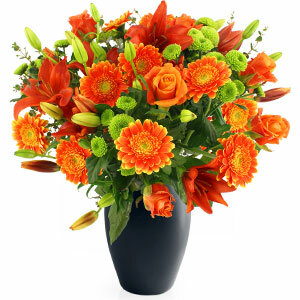 A bouquet of wonderful fresh flowers in warm colours. Arranged in a hand-tied standing in a bubble of water with a big bow and pretty gift message card. Free delivery in our local Essex delivery area with 5% online discount! You can add a delivery date during checkout. Free standard delivery in our local Essex delivery area with 5% online discount. A gorgeous hand-tied of luxury mixed roses and spray roses with luxury foliage. Delivered in their own bubble of water with a lovely bow and pretty gift message card.. You can add a delivery date during checkout. (MAY NOT BE AVAILABLE FOR SAME DAY DELIVERY, CALL TO CHECK). Now with eco-friendly packaging!